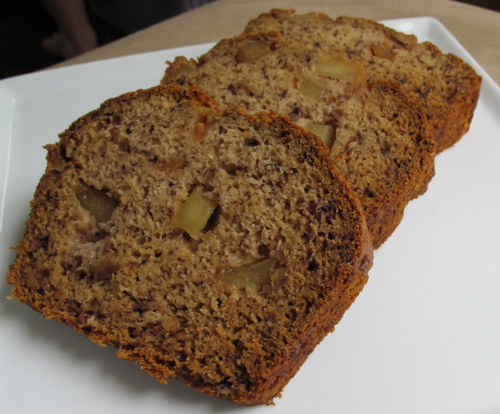 Both vegan friendly and low-fat, an easy quick bread to bake and enjoy. Preheat the oven to 350° and spray a loaf pan with cooking spray. 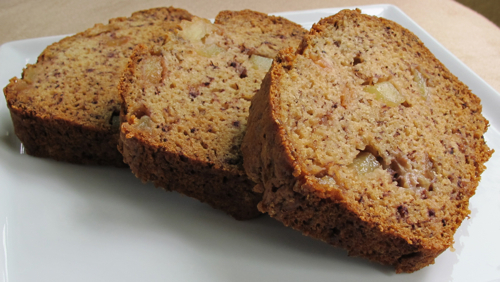 In a large mixing bowl combine the bananas, apple and applesauce. Sift the flour, sugar, baking soda and salt into a small bowl. Add the dry to the wet and stir until just mixed, scrape into the prepared pan. Bake for 50 minutes to 65 minutes (check at 50 and bake as needed), until a toothpick comes out clean. Let cool for a few minutes, pop out and leave on a cooling rack.